An incredible €1.2bn has been spent by Chinese investors on residential overseas property in the first half of 2014, representing an increase of 84% on the same period last year. Global real estate researchers Jones Lang LaSalle (JLL) reported that buyers from China have invested a total €4.2bn on commercial and private foreign property from January to July this year, an increase of 17% year-on-year. Just over €3bn has been invested in commercial property as savvy Chinese buyers sought refuge outside a floundering domestic market and residential purchases also increased on the back of 'Golden Visa' schemes operating in European countries such as Spain and Portugal. The visa schemes provide residency to non-EU investors in commercial and residential real estate spending in excess of €500,000 on property. Visas allow freedom of travel and education across the Schengen countries and the schemes have boosted non-EU investment considerably, particularly from Asia. 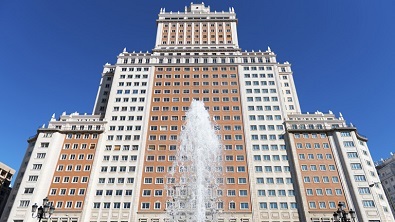 Edificio Espana, Madrid - purchased by China's largest commercial developer, Dalian Wanda. The top investment destination for Chinese buyers was London, notably within the commercial sector. China Construction Bank, China Overseas Holdings Limited and China Life Insurance all purchased offices in the capital's central business district. Greenland Holding Group invested €735m on the redevelopment of the historic Ram Brewery in Wandsworth and Chinese billionaire, Ni Zhaoxing is developing a new Crystal Palace just outside central London with investment of €625m. San Francisco and Chicago came in 2nd and 3rd place behind London for popularity amongst Chinese buyers with €420m and €280m invested respectively. According to JLL Sydney was in fourth place followed by Madrid after China's largest commercial developer Dalian Wanda bought a historic skyscraper in Spain's capital city from the nation's largest bank, Santander at a cost of €275m. 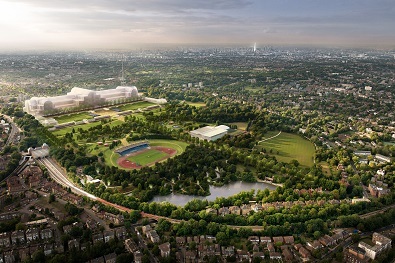 Aerial view of how the new Crystal Palace will look after €625m of Chinese investment. "For first-time overseas investors it makes sense to target the most liquid cities, but for the more experienced, looking at smaller less liquid markets like Spain where yields are higher but so are the risks, it is a natural progression," JLL's global capital markets research director David Green-Morgan said. The report highlights developers and insurance companies as the most active investors with interest shifting more from core office and mixed-use development projects in hub cities across the world to hotel and hospitality products in popular Chinese tourist destinations. Chinese buyers of residential property have surged in Spain since the introduction of the 'Golden Visa' scheme in October 2013. Asian investors are particularly attracted by the high-value opportunities available to them in coastal regions of Spain where property is still discounted up to 35% from its peak in 2007. Q2 2014 saw Spanish house prices going up by 0.8%, the first recorded increase in six years, reflecting heightened interest predominantly from foreign investors, many from non-EU countries. Spain's domestic property market remains constrained by affordability in a climate of high unemployment and increased taxation, paving the way for foreign investors to snap up second home bargains in one of the world's most popular tourist destinations.